It is no faux pas that Faux Bois is a super hot trend with lasting power. If you aren’t familiar with the term, faux bois referrers to the artistic imitation of wood or wood grains in various media. 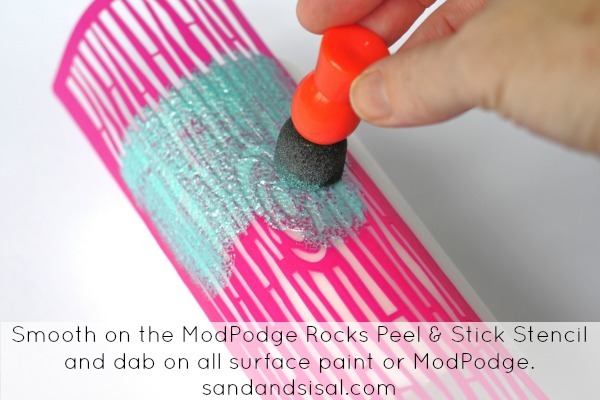 I am so happy to introduce the new Mod Podge Rocks Peel n’ Stick Stencil line by my friend Amy at Mod Podge Rocks. You can find these stencils exclusively at Michaels right now. I will be totally honest, I love these stencils. I have recently tried a few other so called “sticky stencils” and ended up with about 4 mega craft fails. So, I must admit I was hopeful, but skeptical when she asked me to review her stencils. I chose the faux bois stencil to try out. What is nice about this stencil is that you can use it over and over again. I must have experimented with it over a dozen times and washed it and dried it and yet, it still sticks as secure as the first time! Why do you want it to stick so well? Why THIS brand of stencil over others? BECAUSE BLEED THROUGH IS NOT AN ISSUE! Amen to no bleeding hearts! Seriously, I kinda squealed when I tried it out and there was zero bleed through! Yay AMY! You ROCK! So let’s put this puppy to the test. I removed the stencil from its backing carefully, ensuring not to accidentally rip it. The stencil was very tacky. My experimental guinea pigs were a few candles I had laying around house. The Mod Podge Peel and Stick Stencil clung immediately to the candle like the annoying polyester skirt around your thighs on a Sunday church morning in February, when you wish you had a bottle of hairspray in the glove compartment. (Oh yes, I see all your knowing and nodding heads…. been there haven’t ya?). But in this case, that is actually what we want! Let’s test the stencil with paint. Because we are painting on wax, I chose to use Martha Stewart All Surface Paints. Martha will not lead you astray! These paints (also by Plaid, the makers of Amy’s stencil) are the absolute best paints I have ever used. I dabbed the paint onto the candle with a sponge dabber and immediately peeled off the stencil. Wash off the stencil. Allow the paint to dry then re-position the stencil again and repeat the process until the entire surface of the candle is covered. 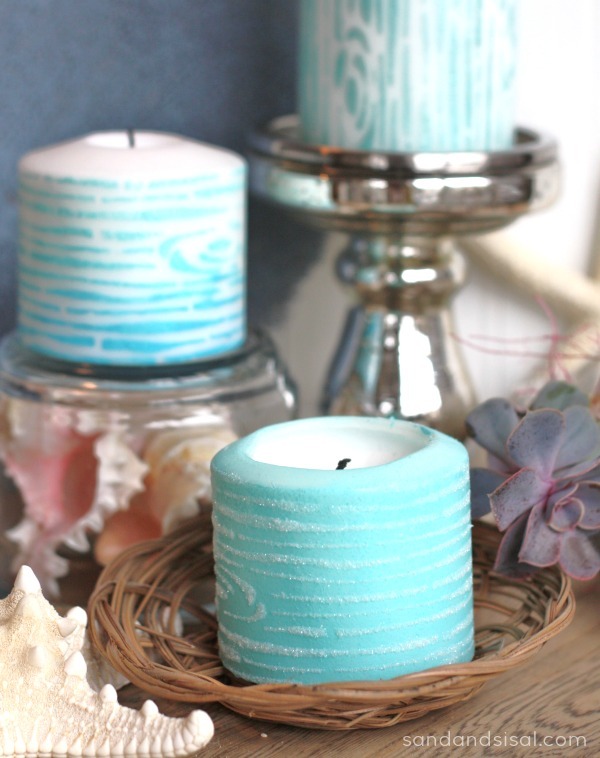 To create an ombre effect on a candle I wrapped the Mod Podge Peel n’ Stick Stencil around a small pillar candle and dabbed on 3 tones of aqua blue (all MS all surface paints). 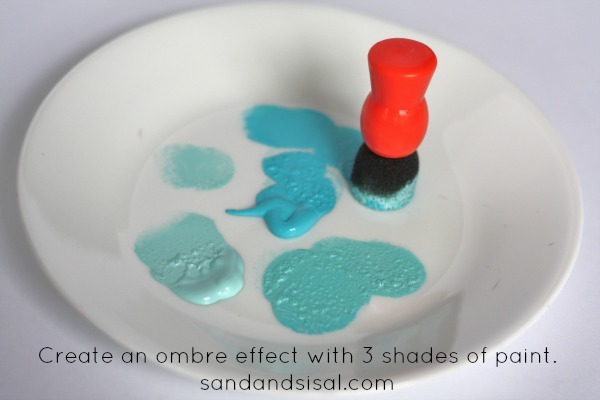 This soft and subtle ombre effect can be achieved in just minutes. For a final bit of experimentation, I wanted to see how it worked with a textured medium like glitter or sand. I first painted a small candle with the MS paint and allowed it to dry. I then applied the stencil to the candle, dabbed on Mod Podge medium in a matte finish, and then sprinkled on the sand. I tried using white pool filter sand but found that the size of the sand grains were too large. Craft fail. Let’s try again. I washed off the candle in cool water (yep water! Remember we used ALL-Surface paint. It won’t wash off! ), dried it and then tried a new approach. Let’s use ultra fine white glitter. The results are exactly what I expected…. beautiful! After you apply the stencil, dab on the Mod Podge, and just sprinkle on a generous amount of fine glitter, then remove the stencil. Voila! Pretty sparkly faux bois! 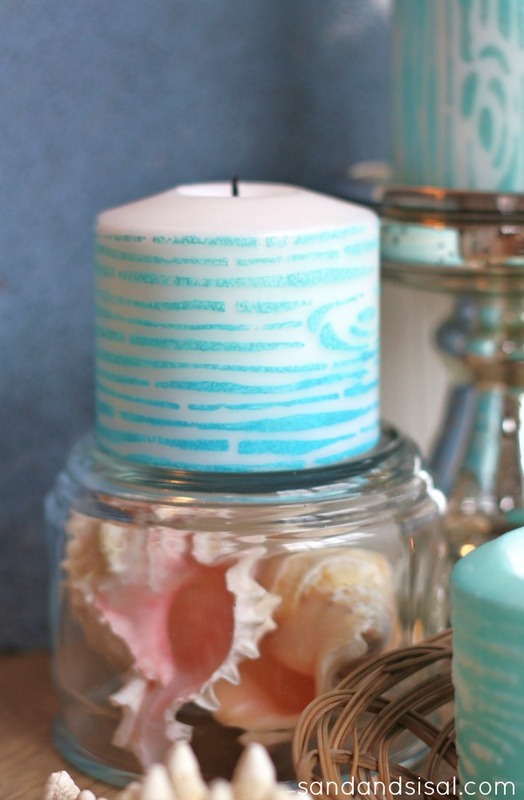 Isn’t this a fun way to dress up some candles? And what is so nice is that these stencils can be used over and over again. 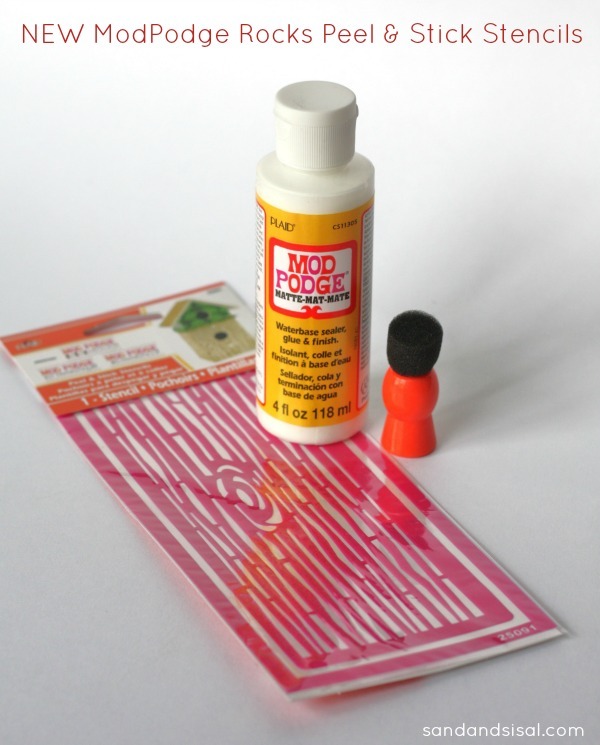 Ready to give these adhesive stencils a try? You can find them at Michaels crafts stores throughout the USA. You can choose from these 9 different designs. OR YOU CAN WIN ONE! AMY IS GIVING AWAY YOUR CHOICE OF ONE STENCIL TO ONE WINNER (USA RESIDENTS ONLY). ENTER IN THE RAFFLECOPTER BOX BELOW. I love that you stayed with the Coastal colors. That is such a cool product! Love the faux bois, and love how you used in on the candles. Thanks Brittany! I figured, why not candles!? I’ve seen how pricey candles can be and I know we can rock all of those out of the park! haha! These are BEAUTIFUL! Thank you! I love them! You are so very welcome! I’m honored to represent you! You have done so much for me and this is the least I can do for you! These are so cute! I was so excited to see Amy’s products at my local Michael’s, will definitely be getting some! She is amazing isn’t she? Thanks for supporting Amy! All of them! but first hard to choose between the keys and the woodgrain. With the keys I am making a bulletin/vision board and putting the keys around with key to happiness (goals), key to my heart (things in life I want) and so on……with the woodgrain, I want to do a frame like Amy did and now those candles! Oh I Love those candles! I have about 4 plain white and I keep them hidden away because they are so drab! I like the keys, I want to use them on a chest I want paint. Love them all and can’t wait to try them! I’d love to win the faux bois stencil. I’d love to use it in the back of a small shelf I have and also make some candles like yours! I would love the faux bois – and I think I would use it on a candle. 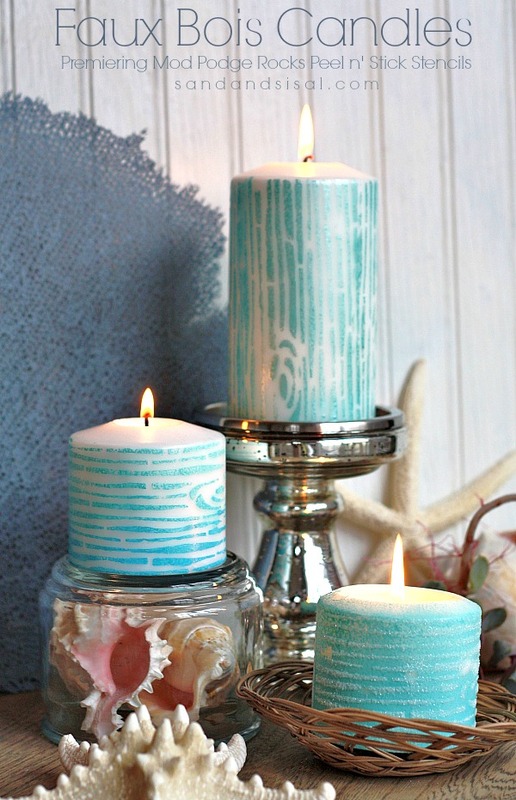 Your candles came out great, I love this idea of jazzing up some boring pillar candles! Definitely going to have to try these stencils! Love the beach theme with the woods rain. Perfect for my house too! Looks like a fun easy craft! I love the chevron, I would use that stencil to ombre paint my leather shoes. So want to try these! I just love the chevron. I think I may do something with the light switches at home. 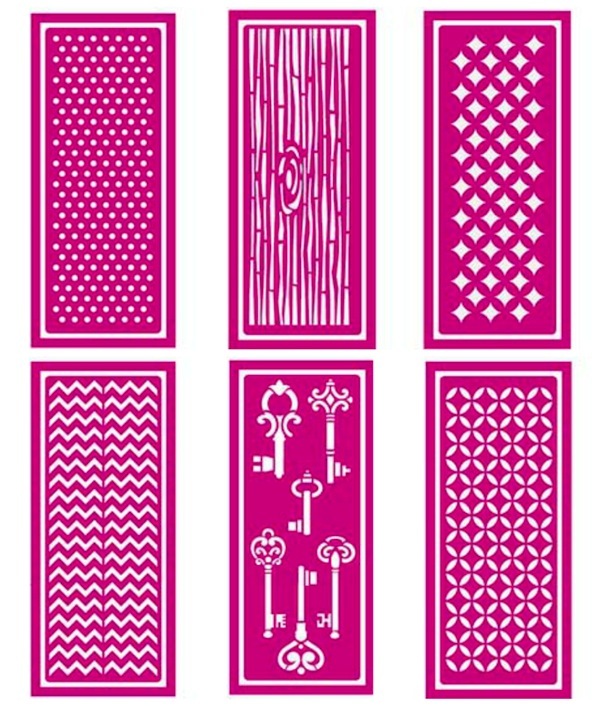 It’s a great set of stencils! I absolutely love the faux bois stencil! Your candles look amazing, i would love to make some of my own! Very pretty! Love your beach theme! I love the faux bois stencil. I had no idea there was a name for that! Thanks for sharing your project. so very very very cute! The Bois sticker…I think I will try it on some old wood with pink paint to put in my granddaughter’s room. I just love the Bois one! I would make some candles with it because I love doing woodland themed buffets! Wow these came out great and I love that they stick to the surface!!! Candles turned out really cute! Would love to try it on picture frames. I would pick the keys, to make cards, and candles look fun to make too! I love the polka dot stencil! I have a brother and then a sister getting married by the end of the year and I could totally use these in some DIY decorations. You are so creative, I would’ve never thought to paint, then glitter. Thanks for the inspiration! This would be perfect for some wedding candles I’m making. Wish we had a local Michaels! Your candles are beautiful and I appreciate the review. Like you, most sticky stencils aren’t working out for me. I’m not surprised that Plaid stepped up to get it right. They are my go to mfg., and adding Amy’s style to the mix is an instant winner. I love the faux bois! I’d stick with that! My husband is not big on this trend, but I don’t care! I’d still use it! I have a bridal shower at the end of March and I’m going to make a few candles for a gift. Thank you for this awesome idea! Your candles rock!! !I love working with mod podge and the stencils are great!My favorite is the wood grain and I will be visiting my Michaels tomorrow to pick them up.Thank you for sharing your wonderful projects you inspire me!! What a sweet comment! Thanks Sarah! Love the wood grain. Would like to try on glass with spray paint. 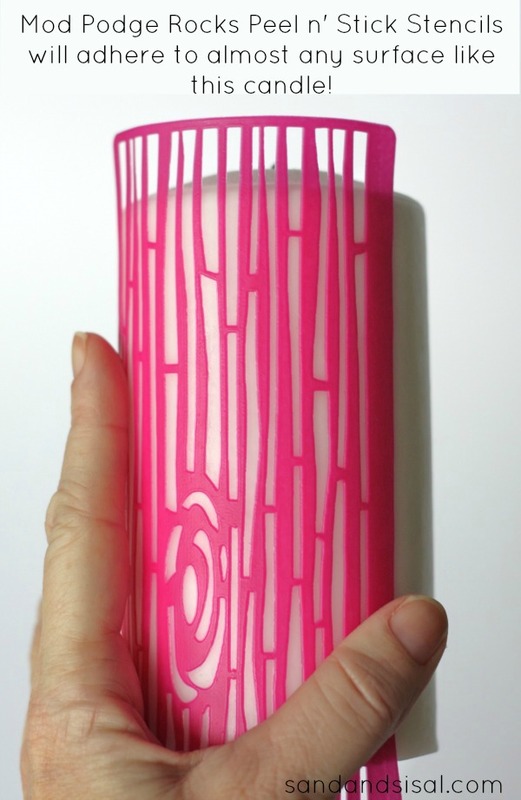 I like the pattern on the bottom right and would try it on a candle like you did. Thank you! I like all, but if i have to choose, it is chevron! How neat!! I could see really decorating at Christmas with the stencils, paint & glitter!! Oh Gosh the Wood one…Oh wait maybe the Dots not sure Love them all..
Love the candles, did you use a matte or Pearl MS Paint, what exactly are those coloiurs, I was just at Michales, and there are so many blues/greens, etc. I’m trying to remember but I think I used 2 paints that were MS Peal (Aquarium & Jet Stream) and 1 Satin (Surf??? it might have been a darker blue). I’m sorry, I went through all my paints and I can’t seem to find the darkest color. The pearl has a nice shimmer to it. Thanks for the colours, I just picked up 3 blues, can’t wait to try it! The burning of the candles has no strange effects with the paint I am assuming? Thanks for sharing!